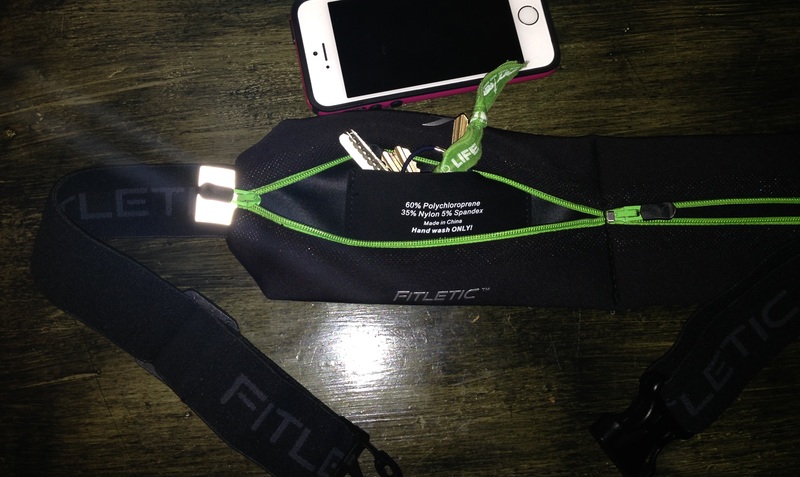 Fitletic Double Pouch Review – and GIVEAWAY! You know I like to run around town a lot and life in NYC can get busy so I usually have to, literally, RUN errands… End my run at the grocery store across town, stop at the pharmacy mid run, etc. I usually need more than all my pockets so I wear my fitletic double pouch a LOT (and if I need a lot more, like clothes, my new Camelbak marathon vest! ), but the double pouch has been such a great friend, I wanted to share! I have a spibelt, which fits a lot of stuff, and usually when carrying my phone, I’d wear the Yurbuds armband. I just got a new Iphone 5, so the armband is out. Double pouch to the rescue!!! -it lays flat, so you can slip things in and out, without having to stretch it out, juggle to zip/unzip, or worry stuff will fly out! -as it lays flat, you don’t feel it in a particular part of your body! It’s stretches out nicely so things in there flatten out! -it’s water resistant and even if you need to carry something sweaty in there, there’s another compartment for your dry stuff! besides a lot of space in the two (TWO) compartments, it has an inside pocket for your keys or whatever so it’s all organized. You could put your gels in one, and reach out with your sticky/gellys fingers every few miles, and keep your id and money all dry in the other one! I once run home from work, with my TWO phones, keys, wallet stuff all in it. I should have taken a picture. Better than pockets. -it comes with those things to put your bibs on, if you don’t want to put safety pins on your clothes, if you’re into that. and a few colors. More info and specs here. Now, big disclaimer, as I am learning from experience. I got the green and should have bought it with the pink line, as now Juan uses it too and I have to pry it off his pants to use it. He put so many gels in it yesterday, I thought he was doing a 50 miler. Turns out, there was not one water fountain open in the park so he came back after 17 miles with frozen gels in the double pouch. Anyway, it is very comfortable, I’d get it again! And we’re doing a giveaway, here’s the rules! Share on twitter a link to this review, and tell us why you want #NoBounce, use the hashtag. Post on your Facebook a link to the review, and tell us why you want #NoBounce, use the hashtag! A picture of why you’d like it (maybe a sign?? hint hint) would be fun! Post on Instagram a link to the review, and tell us why you want #NoBounce, use the hashtag! A picture of why you’d like it, or something bouncy, or whatever pic you think would work, would be great! You have until December 11 to play, and then the great people at Fitletic will randomly select a winner, and we’ll announce it all over the place! They are only shipping to the US so if you play/win, have a US address ready, ok? Happy PLAYING! And please, PLEASE, if you run with keys put them in there (see above) or, if not, MAKE SURE YOU’RE NOT MAKING A TON OF NOISE IN THE RUN, THIS IS HOW.